I found the Kahou Teriyaki Fire Roof food truck at the corner of Broadway and Ocean Ave. in Santa Monica, CA. No web presence. I was driving home from a particularly awful beach workout when I spotted a food truck with the words "Ramen" and "Burger" adjacent to one another, in that order, on the side of a food truck, and not too far from my residence. I called Happy Meal to see if he wanted one. His response was, "Dad, dad...I'll ask the stupid questions here." I ordered a couple of the signature Ramen Burgers, and I hung around while the order was prepared. The flat top cooking surface was viewable through a window, so I had the opportunity to watch the burgers and ramen "buns" cook. 10 minutes later, the burgers were ready, and I was speeding home to share my discovery with Happy Meal. The Beef: The staff was busy at the Kahou Teriyaki Fire Roof truck, so I did not have a chance to get a depth of detail on the burger meat. The 8-ounce patty was strongly beefy and tasted like a 100% Chuck burger. The fat content was average--about 20%. There was no minerality, which would have suggested premium cuts, and there was no taste of funk/aging. The burger was juicy, and this was re-enforced by the moist, dense, ramen bun. The burger patty was just firm enough to linger on the palate and hold its own with the firm noodles. The Seasoning: I observed the nice man behind the griddle hit the burgers with a salty blend of seasoning on both sides of the patty as they sizzled away. The seasoning was appropriate to stand up to a thick, 1/2 pound burger and equally thick ramen "buns." The Sear: There was none. The moisture content of the Chuck, coupled with the griddle temp, caused the burger to steam more than sear. Frankly, a hearty sear would not have mattered from a texture standpoint. The savory, chewy noodle pucks provided a firm chew that would have trumped even the best sear. The Preparation: Both the burger patty and the ramen pucks were pre-formed. All three were cooked on the same griddle and brought up to temperature. The burger was cooked to a juicy Med-Well. Med-Well was just right to denature the collagen in the Chuck, which released all of the beefy flavors. 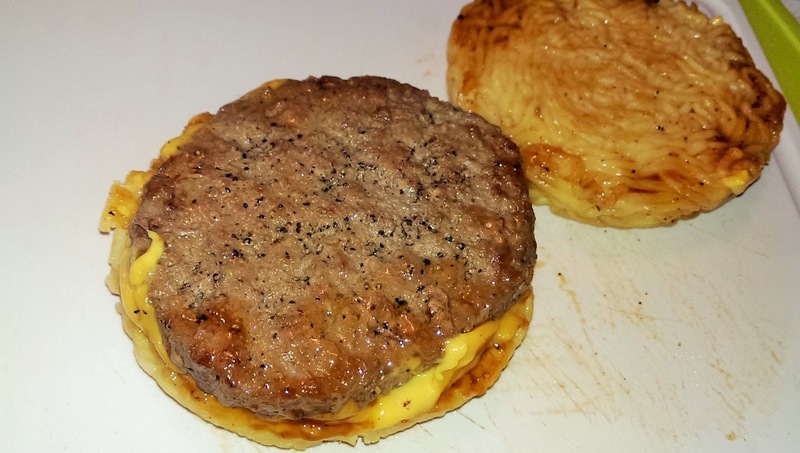 The patties were flipped only once as they cooked, and this was exactly right. The noodles were moist and hot with just a hint of carmelization, but not enough to create a stiff and overly chewy crust. The Cheese: American...eff yeah! There was only one cheese choice at the Kahou Teriyaki Fire Roof truck, and that choice was the correct one. The American cheese was a decadent addition by way of texture. It added a creaminess to the firm mouth feel of the ramen. The iron and saltiness further served to complement the combination of beef and bun. The Bun: The bun was exactly what I hoped it would be...dense, moist, chewy, savory, slightly sweet...you know, like a puck of satisfying and tasty ramen noodles. The bun was heavy...at least as heavy as the burger. The bun and beef patty weighed in at about a pound. That's not all, though. The noodles had been cooked, cooled, and reheated. The result was that the starch in the noodles was converted into a resistant starch. What? That's right! The glycemic index was lower than fresh noodles, because the starch behaved more like a fiber than a sugar. The Meat To Bun Ratio: This was perfect. The vermiform bun paired nicely with the beef patty to deliver a consistent bite throughout the meal. The Fries: There were none. The Kahou Teriyaki Fire Roof Ramen Burgers came with a little bag of Doritos. In other words, "all that and a bag of chips." Honestly, who needed fries after consuming 1/2 pound of noodles? The Toppings: I wouldn't know. I was there for the ramen, beef, and cheese. Toppings seemed superfluous. There was a bit of greenery on my cheeseburger, but it went unnoticed. The Value: $8 for a pound of delicious noodles and ground beef. I was not disappointed. The burger value at Kahou Teriyaki Fire Roof was strong. Normally food trucks jack up the prices (sort of like the airport). This food truck was a welcomed exception to that trend. 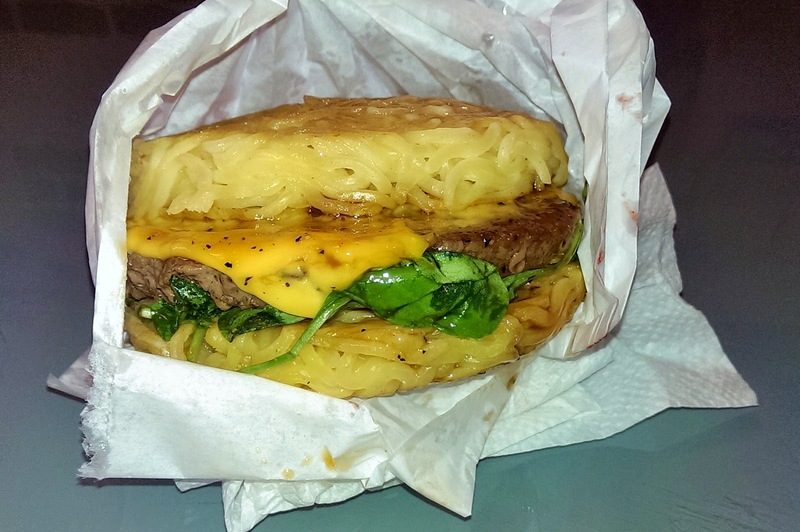 Ramen-bun cheeseburgers are a novelty rather than a mainstay, and I am glad to have that out of my system. I am even more glad that I tried my first at this food truck, because it was excellent in pairing, execution, and value. Burger Review : A novel and tasty combination of ramen and burger were absolutely enjoyed at the Kahou Teriyaki Fire Roof food truck. If you see this truck anywhere, stop by and enjoy a cheeseburger...you will be happy that you did. Interesting. I have seen these ramen burgers before and I always thought they were too weird to be good, but it seems like it's quite the opposite. I look forward to reading your review of the new Steak N Shake that opened on the Third Street Promenade.